Guide Dogs of America held its 36th annual William W. Winpisinger Charity Banquet this past weekend. 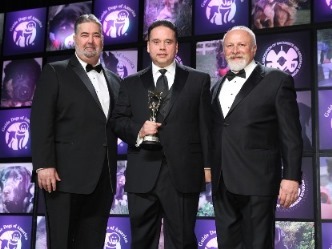 Pictured from left are International President Bob Martinez, 2016 “Gift of Sight” honoree Western Territory General Vice President Gary Allen and Guide Dogs of America Director Dale Hartford. Guide Dogs of America (GDA) held an array of fundraising events in Las Vegas last weekend, including the 36th Annual William W. Winpisinger Charity Banquet, which honored its fundraisers. The charity’s highest honor, the “Gift of Sight Award,” was presented to IAM Western Territory General Vice President Gary Allen and U.S. Sugar Corporation President and CEO Robert Buker. WATCH: Guide Dogs of America Charity Banquet, to see highlights from the evening. The successful weekend of fundraisers included the charity banquet with nearly 1,000 people in attendance, a golf outing with 250 golfers, the Hawgs for Dogs motorcycle poker ride with over 100 participants and a sporting clay event with more than 60 participants. The banquet also included the drawing of the GDA Harley-Davidson motorcycle raffle winners. Monyea White won the grand prize of a custom 2016 Harley-Davidson Road Glide Ultra. The IAM/TCU member from Antioch, CA purchased the ticket at the IAM Grand Lodge Convention in September. GDA Graduate Teresa Blevins drew the winning ticket. The post GDA Honors GVP Allen and Fundraisers at Las Vegas Banquet appeared first on IAMAW.